← Wow, look what happens when you look back! Look what we DID! 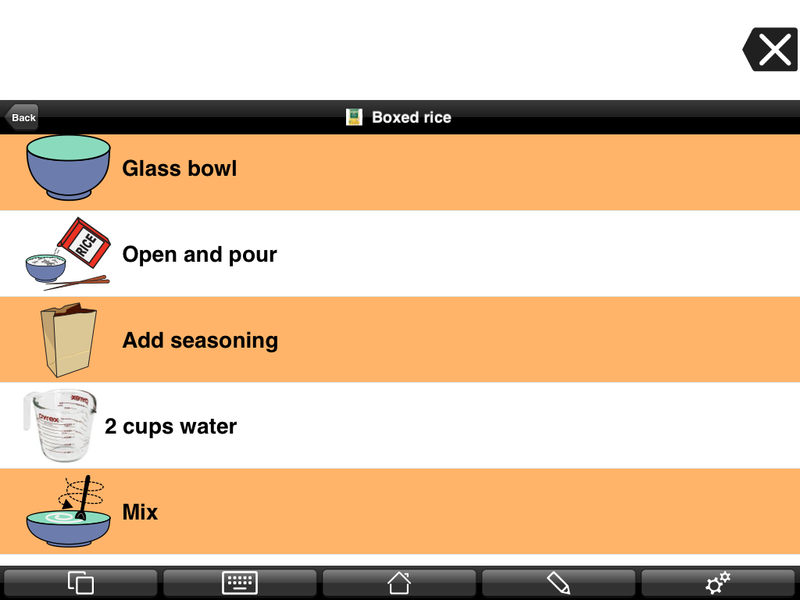 Abbey can Make Rice, using Proloquo2Go on her iPad mini! Wahoo, Go Abbey, Go! One of Abbey’s favorite foods is rice, so we decided that this may be a good place to start with teaching her how to cook. I can’t believe how quickly she caught on once we put the steps on her iPad mini, using Proloquo2Go, her communicating app. She is very visual! I made a video so you can see her in action, it’s very exciting for us!! Click on this link to watch…Abbey’s Video Making Rice. The picture above is a screen shot, showing how I set it up. I am using “List View”, using the app Proloquo2Go. In the video, you will be able to see how I have it set under her ‘foods’ folder. Most of her app is set up using “Grid View” but there are some really great uses for the “List View,” like this. You’d use this for anything with steps, like a schedule, getting ready in the morning, etc..uses are endless, useful for whatever you may be working on with your child! I’m so thankful for great technology and for great apps like this that help Abbey grow and learn! And, I’m so proud of how hard Abbey works to learn what she needs to learn, it can be so much harder for our kids with autism, or other disabilities than kids without…..Our kids are so Brave! I came here specifically after seeing this video. This is AMAZING! I love how you have done this! I’m always looking for picture recipes/supported cooking for students. I bet I could do this with Pictello (also from Assisiveware), since I don’t have Proloquo2Go. The set up reminds me of the Look N Cook book from Attainment, which is my all time favorite cook book.